A little Sunday afternoon reflection that is worth sharing and will hopefully bless somebody. I was sent this picture the other day when I was training a young setter. I first thought it was pretty cool that I’m 34 years old and can still demo proper setting skills correctly. In the picture, I am jump setting and still look like I could be a competitive athlete. I was feeling pretty proud in the moment, and then in an instant, I was completely humbled by a memory. I remembered how in my playing days I used to hate my thighs. I would look in the mirror and think that I was fat compared to other volleyball players, and feel completely insecure putting on a volleyball uniform. I always had confidence in my game, and win or lose, I would go out fighting, but in my body, insecurities took over. But what I never understood back then, but I finally understand today, is that God formed me to the detail like it says in Psalms 139. Here I was, an athlete who could throw on a uniform and play this game of volleyball. 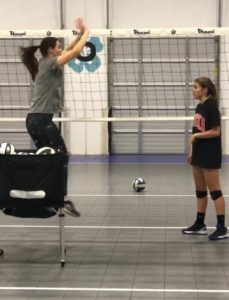 Instead of counting my blessings of how fortunate I was to be an athlete who had good hand-eye coordination, and appreciating the strength in my thighs, I was hating the size of them and that they were so exposed in spandex. So with this picture, at 34 years young, I can finally tell you that I appreciate knowing Him, who has formed me to the very detail “inside my mother’s womb” (Psalms 139). He does not make mistakes. He doesn’t want you to compare yourself to others, but instead look up and allow yourself to be loved on by Him, your creator! What growth I tell ya. Keep it up God. I like what You are doing.